At the Marjorie Luke Theatre, Friday, December 14. 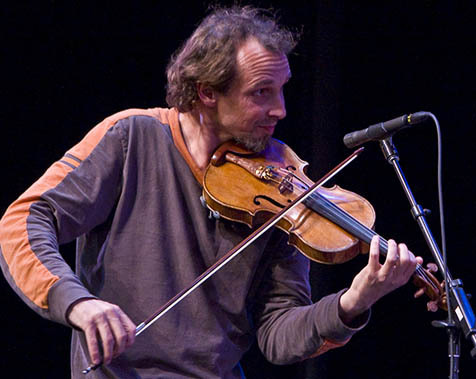 Gilles Apap welcomed an all-star coalition of California string players to the Marjorie Luke Theatre for a show of mostly traditional American music. A notably large, grinning, and wriggling crowd filled the Marjorie Luke Theatre on Friday night when the tri-counties’ resident virtuoso violinist/fiddler Gilles Apap returned to the scene of a good time. Earlier this year, Apap spearheaded a Celtic fiddling evening at the Luke featuring Kevin Burke and other famed worldly fiddlers. This time around, the focus was closer to home, in more ways than one. This was a night when American fiddling traditions of yore ruled, with bands like the Growling Old Geezers (from Apap’s current hometown of Arroyo Grande), the Gap Tooth Mountain Ramblers, and other players who have had the pleasure of appealing to Apap’s Americana-loving musical persona. Friday’s show was also officially a CD-release party for Apap’s first all-old-timey music recording, on his expanding ApapAziz record label. That was actually only half a joke: The rest of the night unfolded like a “this is my life” round-robin performance, as Apap ushered out many of the bluegrass and old-timey musicians he has played with and learned from during the past 20 years, including fiddle culture gurus Phil Salazar, Jim Wimmer, and Peter Feldmann (a kindred spirit in that he, like the French Apap, came from Europe and found himself in love with old-time American traditional music). On this occasion, Apap mostly blended in with the musical guests, although he did step out for a fancy, Grappelli-esque solo on Jimmie Rodgers’s “My Carolina Sunshine Girl,” tastily sung-and yodeled-by Feldmann. So many musicians drifted on and off stage all night that it was hard to keep track of the massive guest list Apap had gathered here from all corners of California (and Alaska and Silver City, New Mexico). We got a measure of the gang during an encore of “Hangman’s Reel,” with 23 (count ’em) pickers and fiddlers summoning up a big, throbbing joyful noise. Apap was just part of the stomping crowd, and was happy to be there. Ditto from this side of the stage.